Earlier this morning I read a post “Binary Tree: The Diameter” by David Pynes. The post showed up on Medium but was initially written for Towards Data Science. After quickly reading the post I decided to spend time reading the article in my computer, thinking about it and writing a solution in Java. The original article used C++. If I am not able to get this done in a block (I practice Deep Work and use 2-hour blocks) I will take a peek at the code this afternoon. 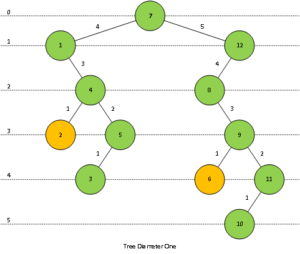 To start we need a formal definition for the diameter of a tree given that the code should produce such number. 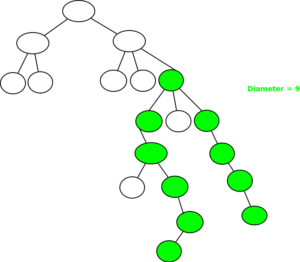 I also want to note that the article called for a binary tree not a BST but the illustrations and animations are for BSTs. In practice I tend to find more practical uses for BSTs so I will develop a solution using them. Given this definition, the diameter of a BST appears to be the longest distance measured in edges, between nodes that have a common parent; that is, they are children from a single node. That said; we might need to locate such nodes and compute the individual distances to the root. That seems to be referred to as the height of each node. OK, so far so good. As usual I will attempt to implement a solution using Test Driven Development (TDD). I will see if I use some code from a previous solution for BSTs. That was I could reuse the BST implementation. Let’s first take a look at a diagram of a BST that was generated by the solution. We start on the left side of the tree and start going up. When we reach node 4 we have the choice of selecting 1 or 2. Given that we are looking at the largest diameter we choose 2 and continue our way up. We then move to the right branch and start going up. When we reach node 9 we have the choice of choosing 1 or 2. We choose 2, increment by 1 and keep on going up. When we reach the root we have 4 on the left branch and 5 on the right. The dimension is 4 + 5 = 9. Let’s now look at a second diagram. We follow a similar route from the bottom up and we end up with the value of 2 on the left side of node 47 and with 5 on the right side. The dimension is equal to 2 + 5 = 7. Note that we did not touch the root of the BST. Let’s now take a look at the Node class. Please note that we will not use the parent or the depth in the algorithm used to find the dimension. Until recently, I have been rewriting code from scratch each time I implement a data structure. It seems like repeating the same task over and over (i.e., creating a Node class to be used in a tree) is a waste of time. We can just reuse classes. In this example I was going to write the solution code in a separate solution which I had already created; but I forgot and added to the one you will see shortly. Sorry about the clutter. In this class I have added the diameter member. The reason for it is that in Java arguments are passed by value. We need to update this variable and we could have declared an outside variable but using a member seems somewhat more elegant. We also can protect it as needed. Note that in our code we declare both class members private. Of interest are the diameter() and findDiameter() methods. I started with different names but changed them to loosely match the C++ code in David’s post. The diameter() method is public so it can be called by the solution code. It sets the diameter member and calls findDiameter() which is a recursive and private call. As you will see, I use other convenience functions, some of which are in this class and others in the solution. * Generate an array of random numbers in the specified range. * using a random order. * Return an array out of four based on the argument. * Build a BST and perform some operations on it. // ???? exit the program ???? In earlier posts I have used the functions which are now commented at the start of the main() function. Please disregard them. I also used them while developing this code. As you can see there is a loop that starts by using the dimArrays() and randomArray() functions. I worked the code using the second function. Towards the end, I decided to verify my solution with the test cases in David’s code. He did a good job on providing the arrays and results. As you can see I used the four arrays and the results seem to match. We first display the array used to construct the BST. We then traverse each tree in order to easily check that the tree was properly created. The method displays the value followed by a “:” and the depth of the node. The first entry in the arrays is used as a root so it is always at level zero (0). After the inorder() call, we do a depth first traversal. That was done to help me verify that the tree diagrams I generated on paper and Visio were correct. 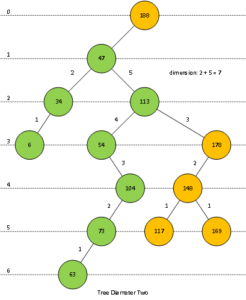 The post order method displays the tree in post order. If you enable the print statement in the findDiameter() method in the BinaryTree.java class you will see that the tree traversal is done in post order. That helps understand and visualize how things work. The reason I displayed the depth of the tree twice was to check that both returned the same values. I could have commented that out because I had no use for them. Finally the diameter for each tree is displayed. Hope you enjoyed this post and most important try developing the code in the language of your choice. Then go back to the posts and verify that all is well. Of course, if you have a comment or question regarding this or any other post, please do not hesitate and leave me a message below. Keep on reading and practicing. Seem like is the only way to learn and move ahead.